Violin Concertos Nos. 3, 4, 5 (for Violin and Piano Reduction). Composed by Wolfgang Amadeus Mozart (1756-1791). For Piano, Violin. String. 104 pages. G. Schirmer #LB2055. Published by G. Schirmer (HL.50485871).ISBN 0634096818. 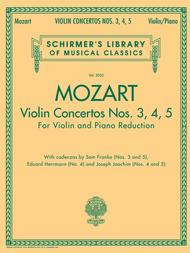 9x12 inches.This convenient publication in Schirmer's Library of Musical Classics collects Mozart's most often-played violin concertos in one affordable volume.